In early November, the Free the Children Nauru Facebook page, set up by teenagers on Nauru, got a whopping 23,000 followers within 24 hours. In late November, The Greens moved an amendment to a government bill in the Senate. 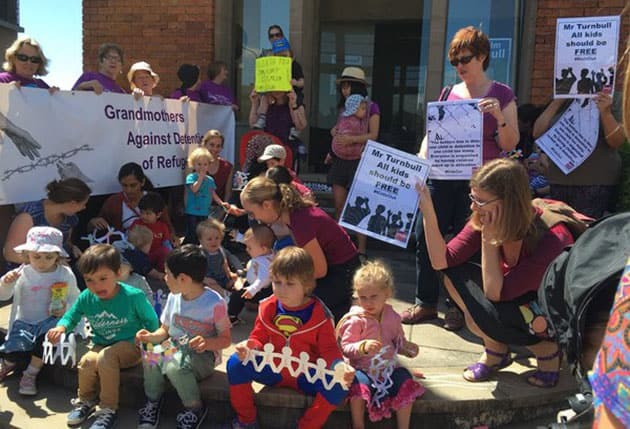 If passed in the House of Representatives, it would require the Immigration Minister to order the release of children from detention but only into community detention (residence determination) within 30 days. The amendments got a lot of attention. Love Makes A Way staged another occupation of Malcolm Turnbull’s office, calling for the Prime Minister, “to accept the recent Senate amendments that would free all kids and their families from Australian detention centres, impose mandatory reporting of abuse, grant media access to detention centres and protect whistleblowers reporting abuse.” Turnbull’s office called the police to arrest them. It is very unlikely that Turnbull will accept the Senate amendments. A vote in the House of Representatives has already been delayed until 2016. Some of the 112 children still in detention are part of families that have been brought from Nauru. The government is too welded to offshore processing to allow them to get out. But perhaps the most remarkable aspect of the Senate vote is that the Labor Party supported it. They wouldn’t have done that a year ago. It is a very small shift for Labor but nonetheless it is yet another indication that the government is losing the ideological battle over offshore processing, and that Nauru really is on the nose. But the mobilisation about kids in detention deserves a closer and more critical look. While it can seem like a useful slogan to mobilise around because it more easily touches the heartstrings of middle Australia, it can also mislead and politically misfire. On Nauru, for example, the issue is no longer “children in detention”. With the open centre declared by the Nauruan government, technically there are no children in detention. Official Australian figures say there are 95 children in detention on Nauru; but in August 2014, there were 222 children there. These children may have been released from detention as refugees. But they, and their families, remain prisoners on Nauru. The official statistics also say there are just 621 adults in detention on Nauru; but around 1200 adults have been sent there. Because some people have been found to be refugees and moved into the community, they don’t count them anymore. But they are still stuck on Nauru. Unless we push to close Nauru completely, “kids out” just leaves them in the middle of the Pacific Ocean, without a future. And there are still 1000 people on Manus Island and almost 2000 in Australian detention centres. The kids do have to come out of detention—not just to community detention—but out, full stop. But unless we campaign to end mandatory and offshore detention for everyone, the job is only half done. THE DEATH of Kurdish refugee, Fazel Chegeni, on Christmas Island led to an explosion of anger and desperation inside the detention centre that has been called Australia’s Guantanamo. The asylum seekers and 501s (the so-called criminal deportees) are the victims of a notorious punishment regime of solitary confinement and behavioural management designed to break people and force them to agree to return home. Only a week before Fazel’s death, an Iraqi asylum seeker “agreed” to go home rather than face another day in Christmas Island. According to the government the riot caused $10 million damage. But that cost is nothing compared to the lives that have been destroyed in the detention centre. Fazel should never have been in detention—and nor should anyone else. In the aftermath of the riot, 17 people were transferred from Christmas Island, 14 of them to maximum security jail in Perth. Dutton was quick to declare, “We’re dealing with some of the country’s worst criminals.” But no one at all has been charged yet over the riot. Christmas Island is the crime—and it is Peter Dutton and the government that must be held to account.